Submersible slurry pumps for industrial dredging, high viscosity material, sludge, and other high solids pump applications. EDDY Pump submersible slurry pumps feature a non-clog pump design for high solids industrial pumping applications. The EDDY Pump’s patented non-clog design with high tolerances allow anything that goes into the intake to be passed through the discharge without issue. This translates to a significant amount of solids and debris that can pass through without clogging the pump. Main Applications: Mining, Wastewater, Chemical, Paste, Oil, Sludge, Paper/Pulp, Dredging, Fly Ash Pumping, Coal Ash and more. The recessed rotor is fully adjustable, allowing the pump to pass the largest material in the industry. In harsh conditions with abrasive materials like sand, sludge, rocks, slurry, normal dredge pumps clog, wear and fail more often. This leads to downtime for maintenance, hindering production rates. This is not the case with Submersible EDDY Pumps, as we have the tolerance to pump solid objects up to 9 inches! Pass solids from 1-9 inches (rocks, rags, debris). 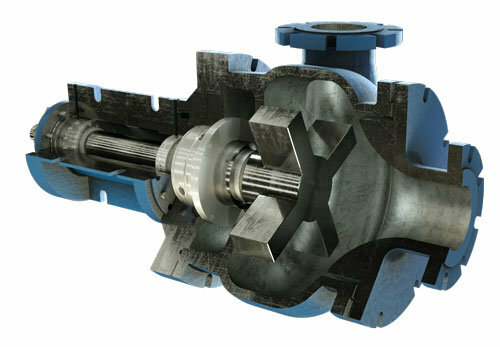 The EDDY Pump’s open rotor design with high tolerances allow anything that will go into the intake to be passed through the discharge without issues. Tolerance between the rotor and the volute in the 4″ EDDY Pump easily allows the passage of a man’s arm (*see picture below). Compared with the tolerance in a centrifugal pump, the EDDY Pump easily wins. Over the span of our 2-inch through 10-inch EDDY Pump line, the tolerance ranges from 1-9 inches. This translates to a significant amount of solids and debris pass through, without clogging the pump. To learn more about the technology behind our submersible pumps continue reading Here. The EDDY Submersible Slurry Pump Makes Slurry and Mud Move Like Water. The Ideal Submersible Pump for Slurry, Sludge, Grit, Fly Ash, Paste and Scum. The Best Non-Clog Submersible Slurry Pump on the Market. Since 1984. Best Applications: If you are dredging or pumping slurry, high solids, extremely viscous material, high abrasives (sand & gravel) and solid laden material, then you found the ideal pump for your job. Industries Most Served: Mining, Fly Ash, Coal Ash Pumping, Dewatering, Oil and Fracking, Waste Water, Paper/Pulp, Chemical, Energy, Water Districts, Irrigation Districts and Dredging Projects. Fully assembled slurry pump easily lets an arm pass through. Rags, 1-9 inch rocks and debris can easily pass through an EDDY pump without clogging. For assistance Call 619-258-7020 and let us help match your project with the right pump. Choose from the Commercial Pump Line or the HD Pump Line. *Commercial Pumps, HD versions available. * Standard performance curve using water. Our water GPM and stats are only listed because there is no industry standard to measure the material EDDY Pump moves. Contact us to discuss your project and specific material transport requirements. * A majority, 98 percent of our clients use our submersible pumps for non-water applications.